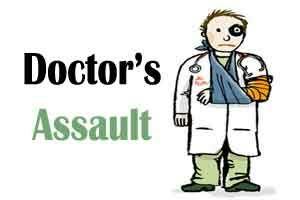 Raiganj: A doctor of a state-run health center in North Dinajpur district was today seriously injured after being assaulted by a mob following the death of a patient, police said. The attackers also ransacked the Hemtabad Health Centre. Police said 32-year-old Tabeda Khatun was taken to the health centre with problems of high blood pressure and asthma last night. On-duty medical officer Dr Bipul Ghosh referred her to Raiganj Super Specialty Hospital but Khatun died before being taken there. A mob, including family members of Khatun, attacked the doctor today and ransacked the hospital, police said adding that Ghosh has been admitted at the Raiganj District Hospital in a serious condition. A case was registered against the attackers but none was arrested.